Thinking of what to make with that tomapep puree preserved sometime ago? Now this is a whole meal you can make. 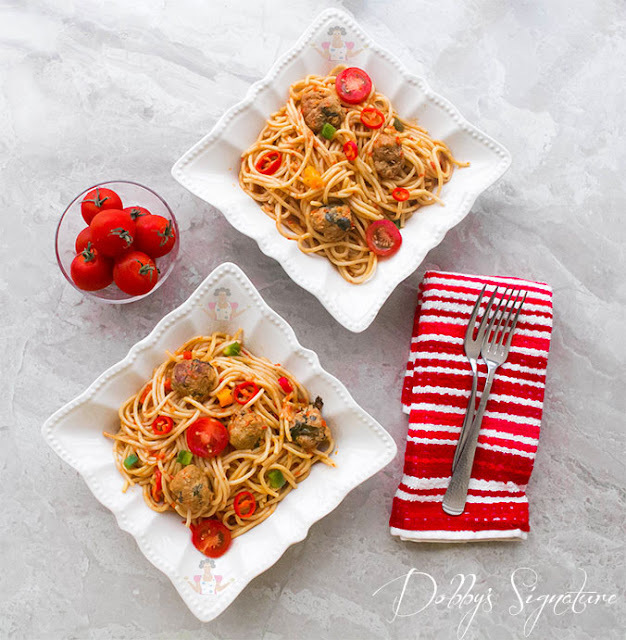 There are various ways you could make pasta and tomapep spaghetti with meatballs is one you should try out. 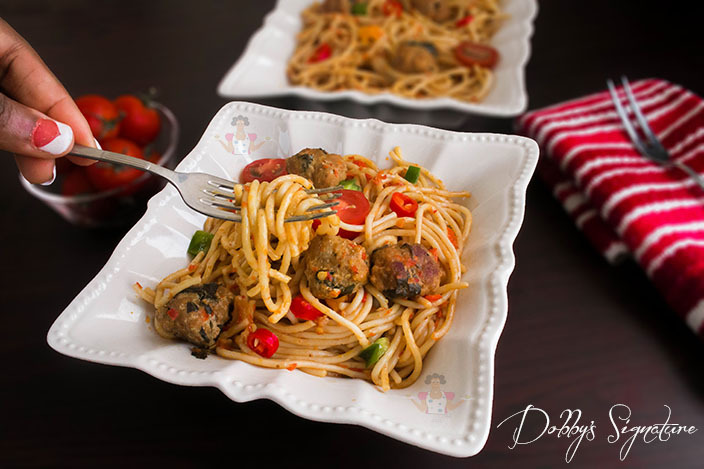 I love pasta because it's a quick fix to curb hunger pangs. 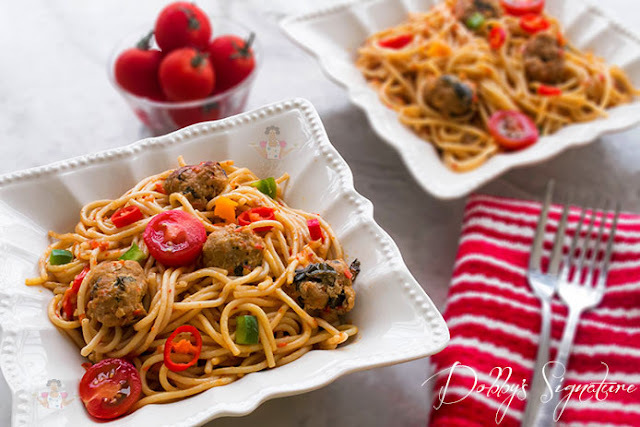 You can prepare some of the ingredients and preserve before hand to make this dish even faster e.g the meat stock, meatballs (chicken or beef) and tomapep puree. 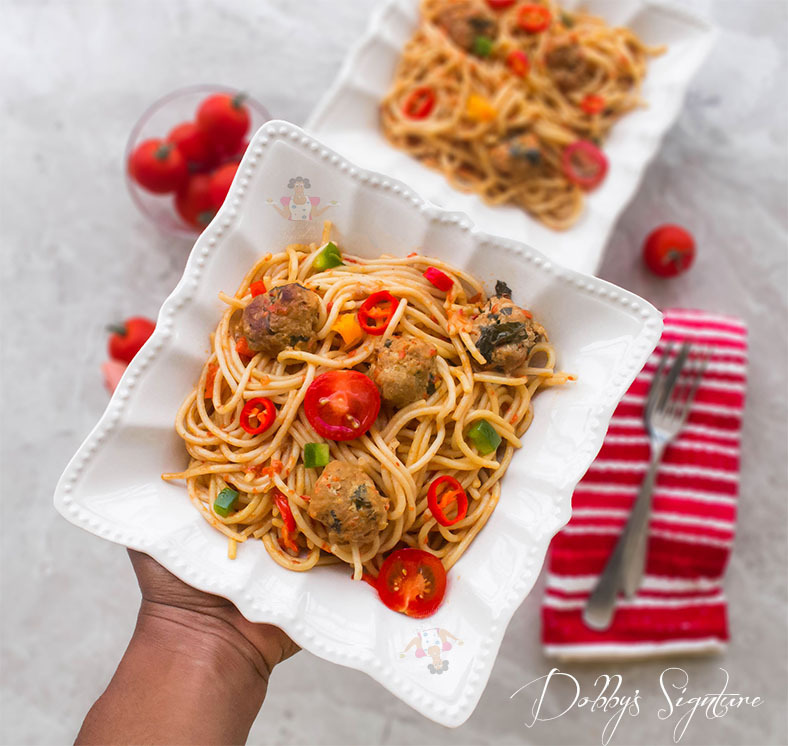 If you love spaghetti, you'd love it better with chicken meatballs. Step 1: Pour water into an empty pot and bring it to its boiling point. Add the Spaghetti and let it soften into the water.Leave this to cook for 5 minutes till its soft to the bite but not overcooked. Drain through a sieve and set aside. Step 2: Place the pot back on the burner and add the chicken balls and deep fry for about 3-5 minutes till it's cooked then remove from the oil - set aside. Step 3: Reduce the oil in the pot, add the onion and stir fry for 1 minute. Add the tomapep puree and leave to fry for 3 minutes before adding the chicken stock and salt to taste. Once it starts to boil, add the pre-cooked spaghetti, stir and leave to cook till it absorbs the liquid.